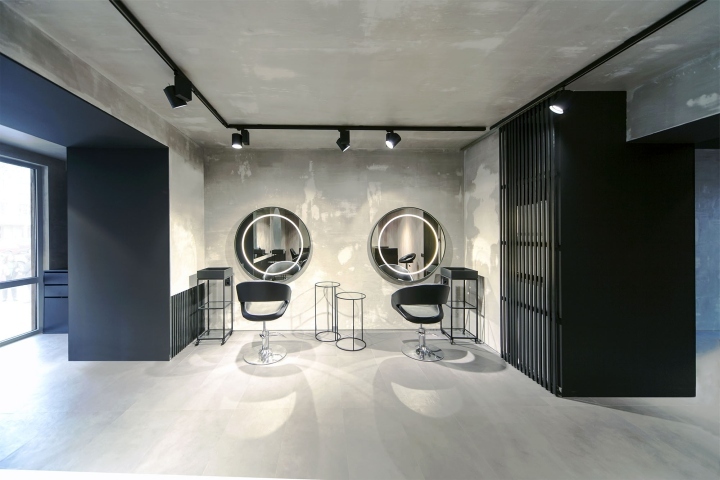 After exploring the world of beautiful barber shop designs, we decided to expand our knowledge palette with some inspiring beauty salon designs that feature world-class interiors. 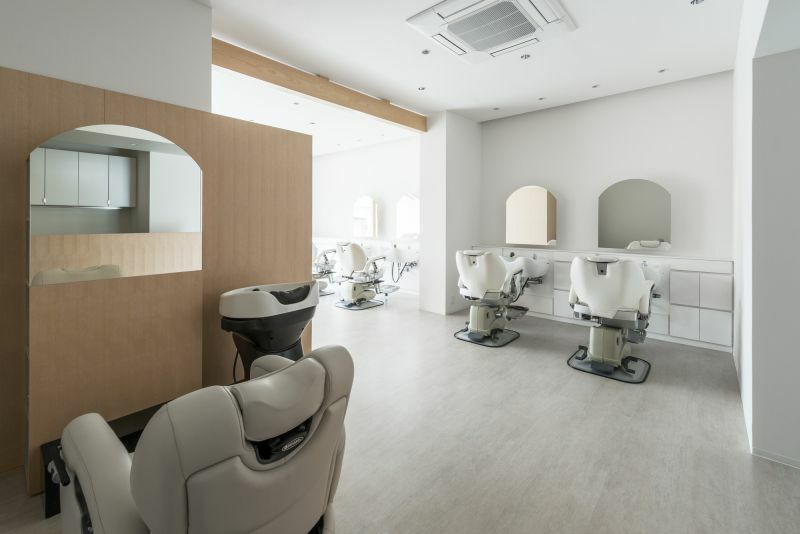 Beauty salons have proven to be a recession-proof industry throughout the world so there’s no need to worry they’ll disappear any time soon. 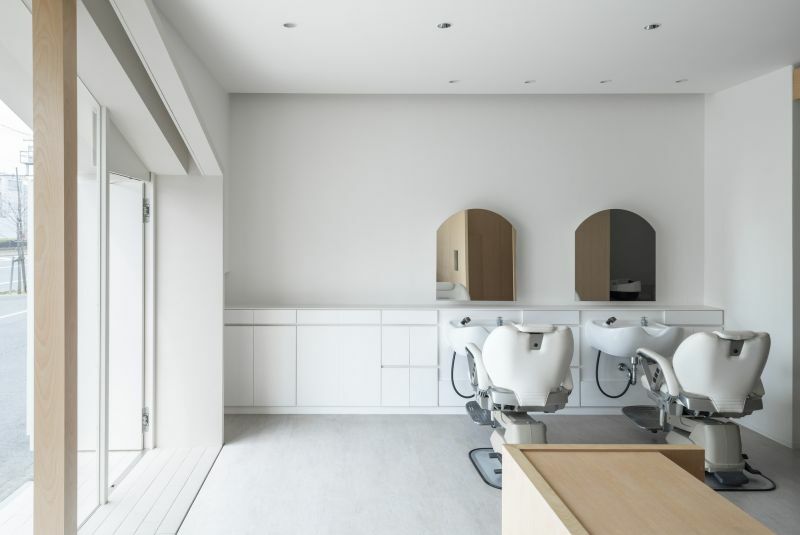 In a way, they’re the updated and more generalized version of a barber shop. 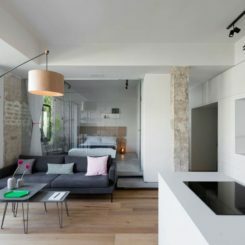 We’ll use the following examples to reveal some of the elements that define their interior designs and unique character. 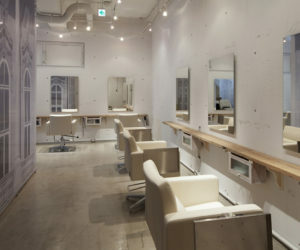 Arkhe is a beauty salon located in Japan. 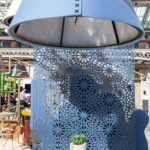 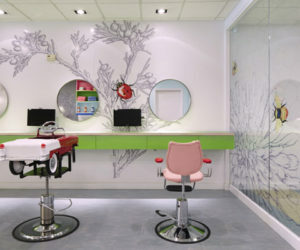 It occupies 120 square meters and was designed by using water and the main theme for the décor. 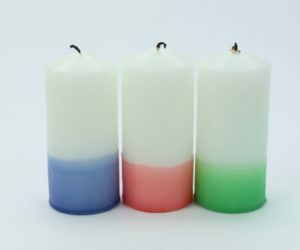 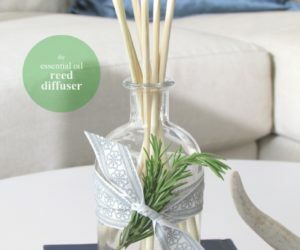 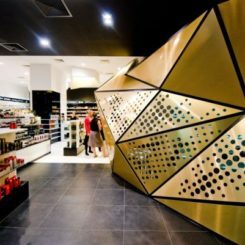 The uniqueness of the interior design partially comes from the palette of materials used throughout. 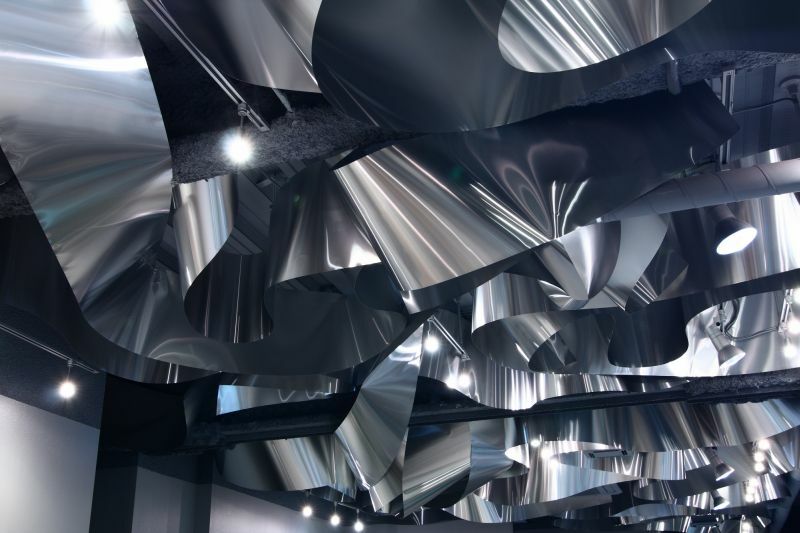 Recycled aluminum sheets were used on the ceiling to create the geometric 3D design that mimics the way light reflects on the surface of water. 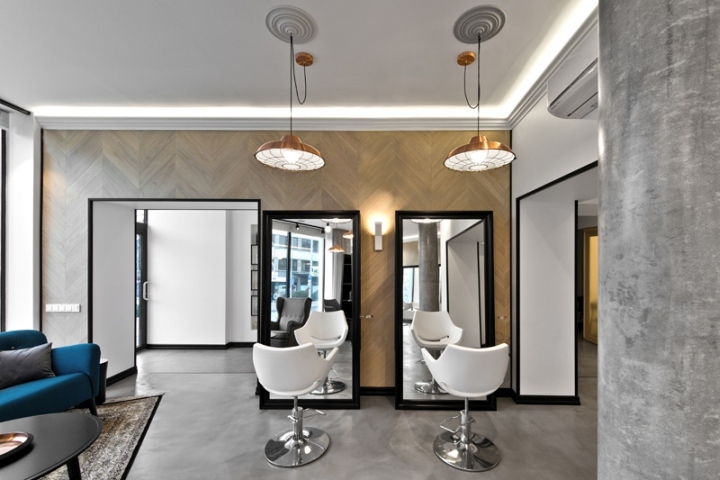 This design strategy also gives the salon a luxurious and sophisticated look without cluttering the floor space and keeping the space simple, open and functional. 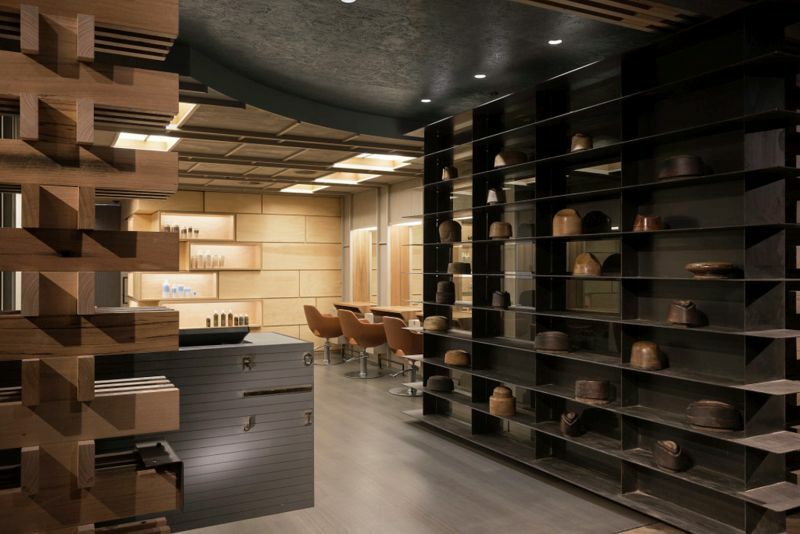 On a contrasting note, the Marien Beth beauty salon from Kobe, Japan, uses a warmer and more grounded design strategy centered around wood. 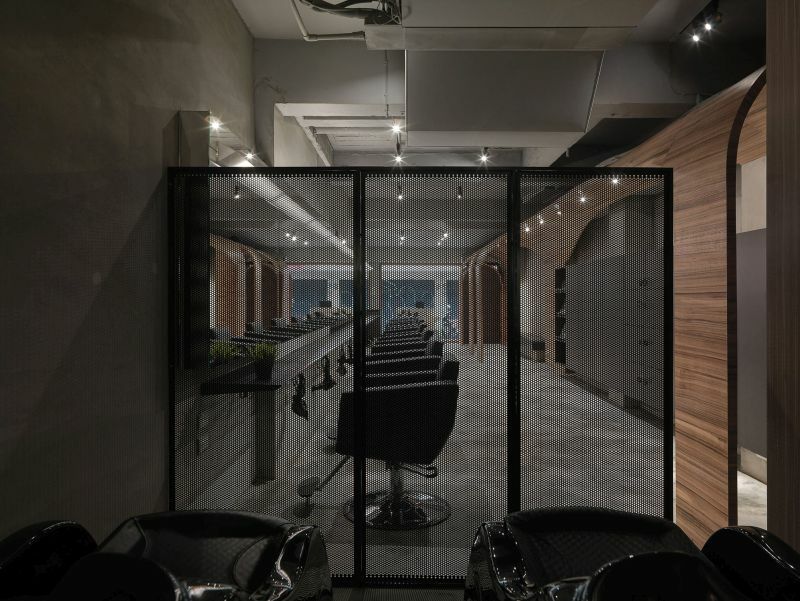 Its interior was designed by and is very inviting, welcoming clients into a familiar setting with wooden furniture and wall panels just like in a traditional living room. 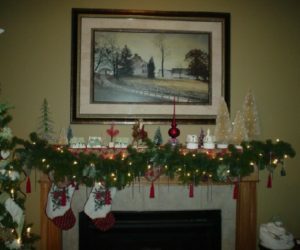 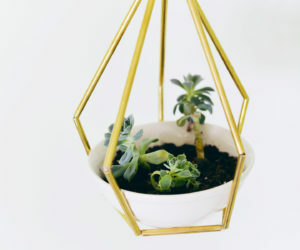 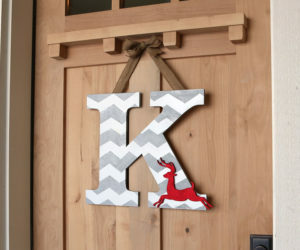 The décor is kept simple and functional with the occasional glamorous touches. 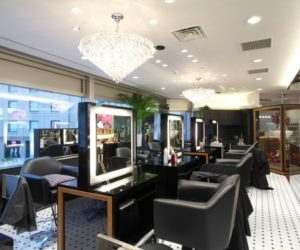 The chandeliers make the work area look particularly elegant and even a little bit opulent without overwhelming the space. 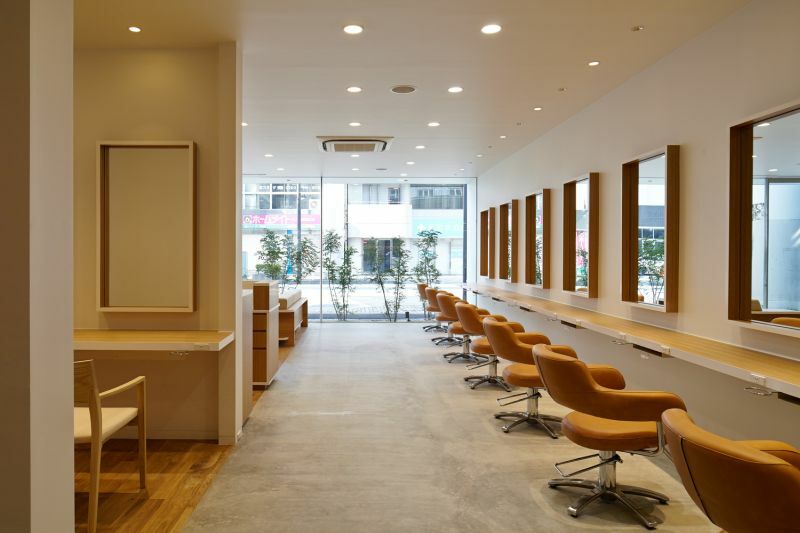 The next beauty salon on our list is also located in Japan, more specifically in Oyama. 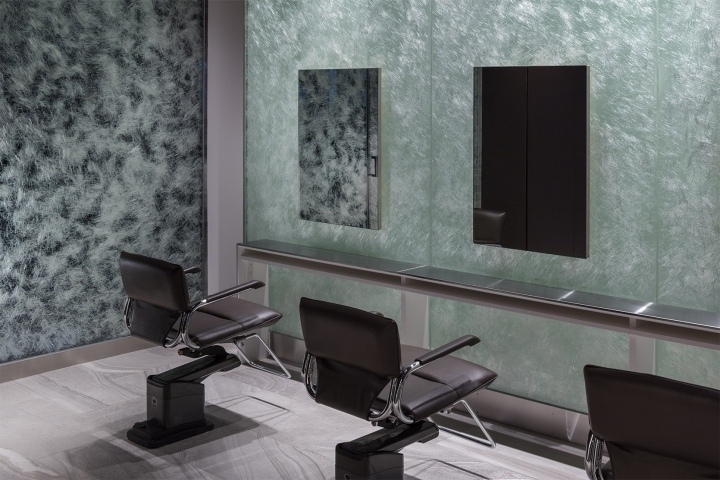 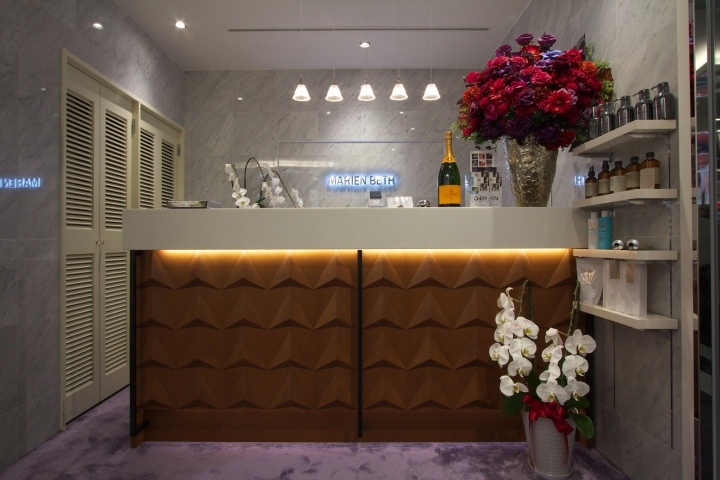 This one was designed by and the team looked for materials with sparkling and crystaline textures for the interior, wanting to give the salon a relaxing but still glamorous look. 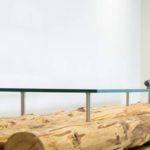 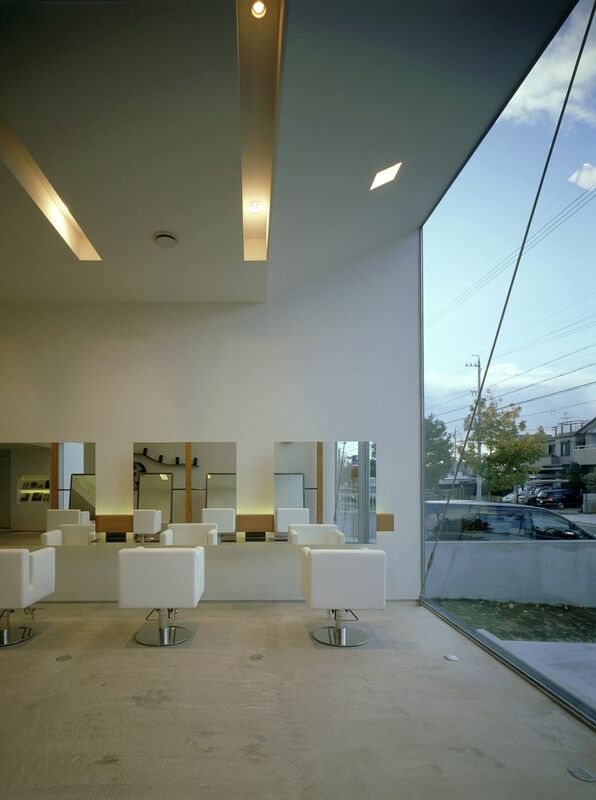 Glass was widely used throughout the space. 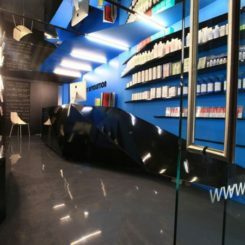 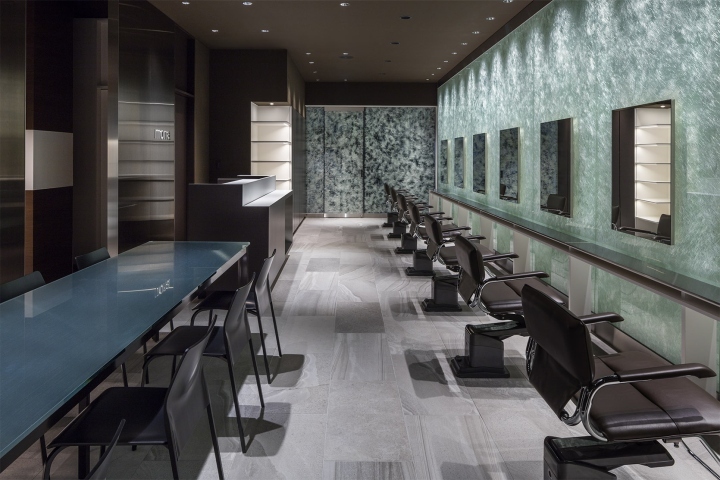 Thin glass fibers are embedded into the facade and interior wall of the salon and they reflect the light creating an eye-catching visual effect. 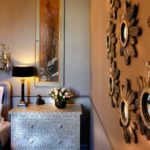 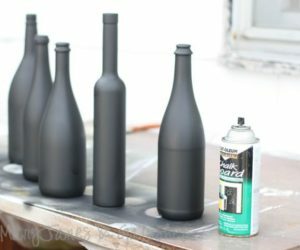 In order to add a sophisticated and elegant touch to the décor, the designers also use bronze-colored stainless steel and dark brown wood. 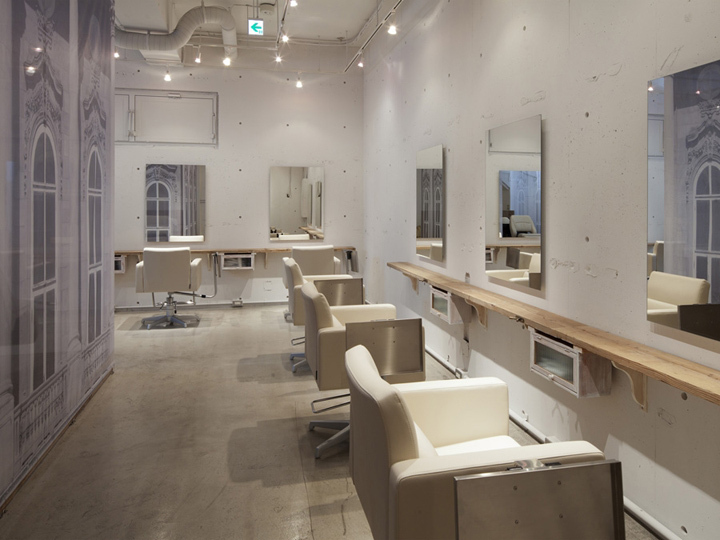 Japan is also home to yet another interesting beauty salon. 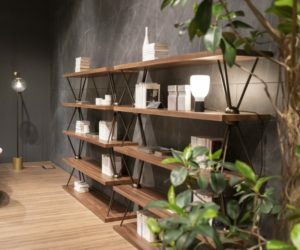 It’s called Mook and you can find it in Osaka. 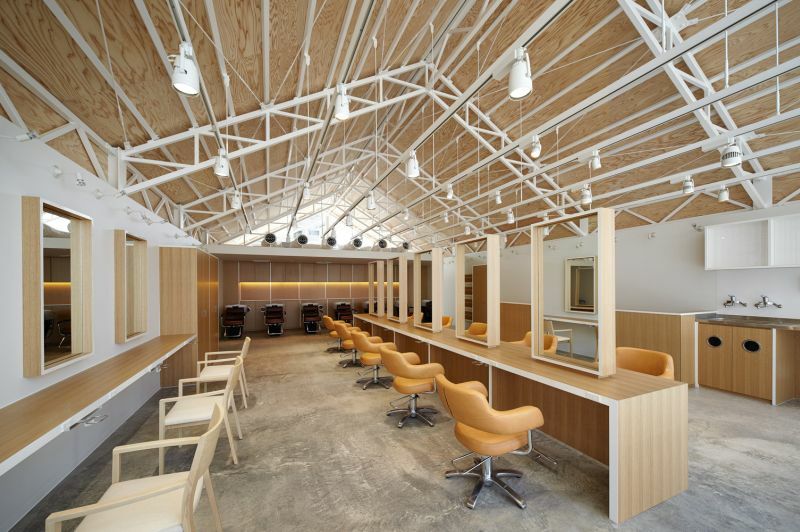 It was a project by and its ceiling and walls are covered with oak boards. 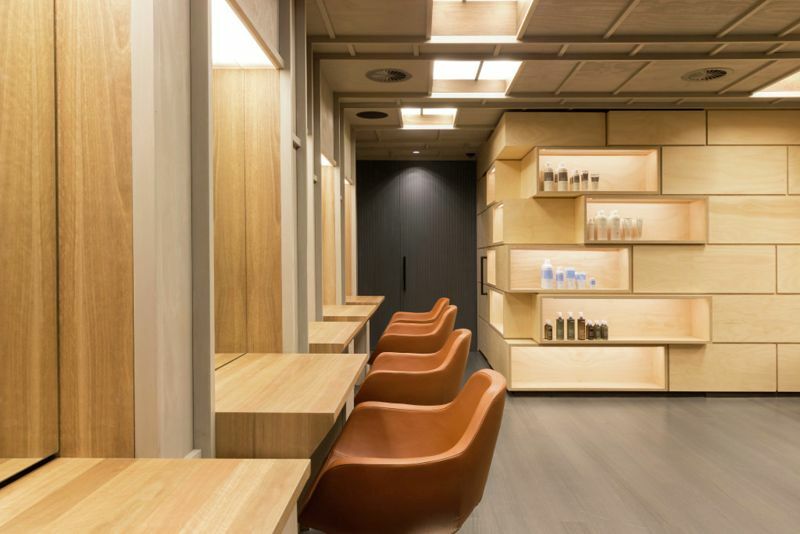 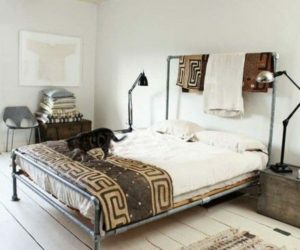 This gives it a particularly warm and welcoming look and transforms the 82 square meters into a cozy and serene volume. 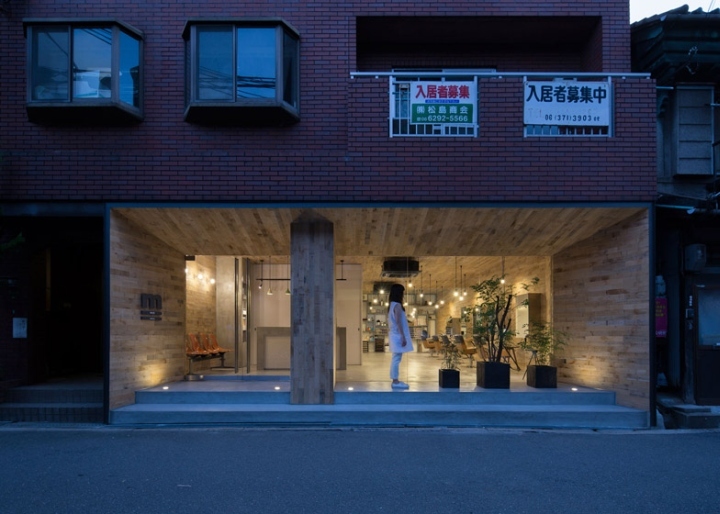 This design strategy also allows the entrance and facade to blend in with the street and scenery. 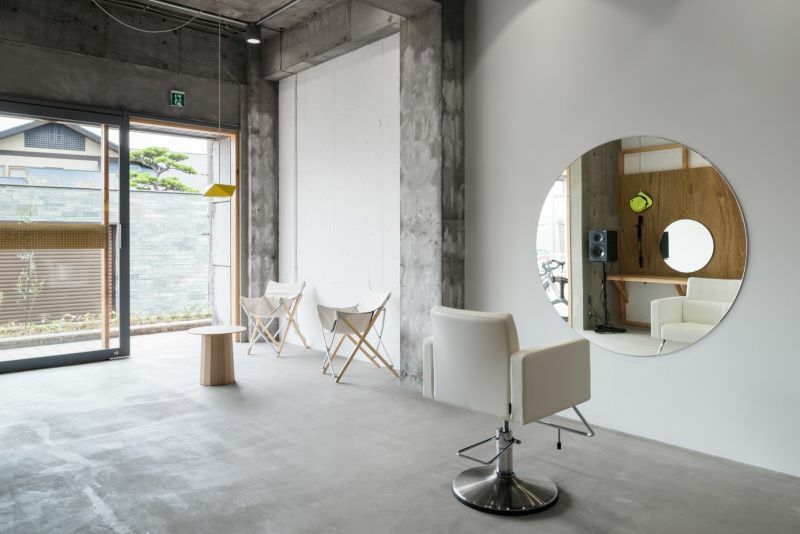 As you enter, there’s a small reception area and beyond that a spacious work area with wall-mounted mirrors of different shapes and sizes. 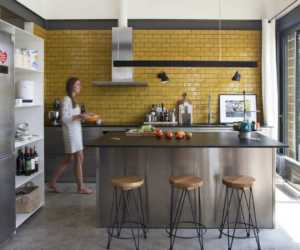 The two zones are roughly demarcated by a large column. 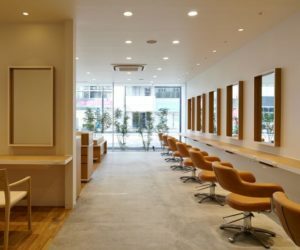 There seems to be no shortage of stylish beauty salons in Japan so we’ll continue with yet another one. 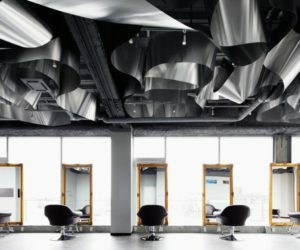 The Coo Hair Eclat salon is a project by atelier completed in 2007. the 125 square meter salon is designed to present the interior as a framed picture, the same way the landscape is usually seen through a large window. 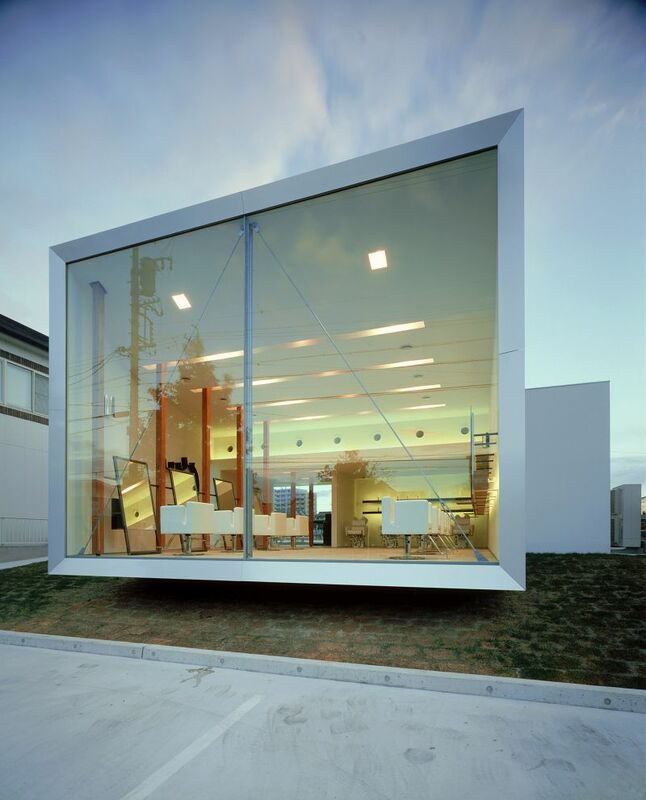 The site on which is stands is sloped and this favorites this type of design. 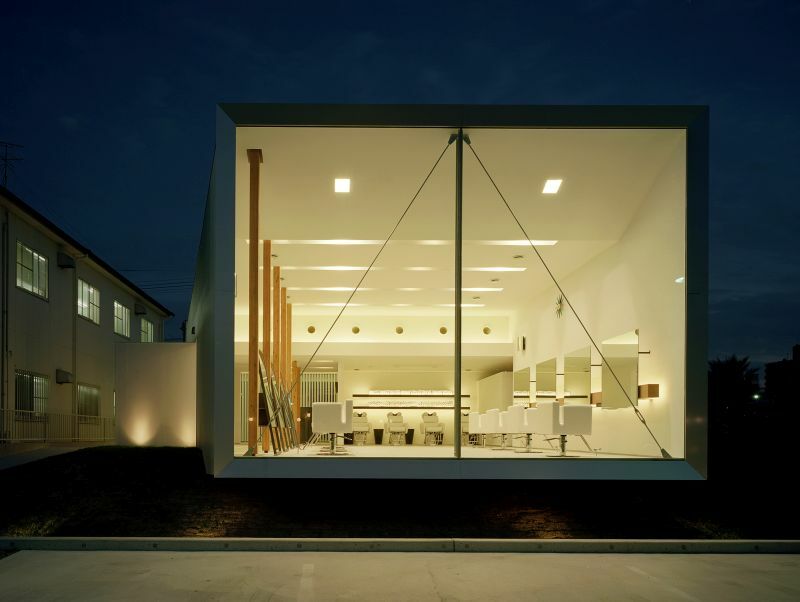 The interior is one big open space with no clear boundaries between the various functions and zones. 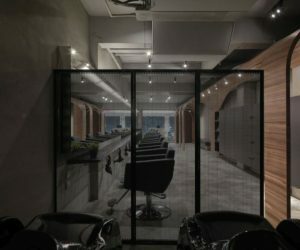 The two adjacent exterior walls made entirely of glass make the salon look like a box exposed to everyone passing by like the scene of a movie. 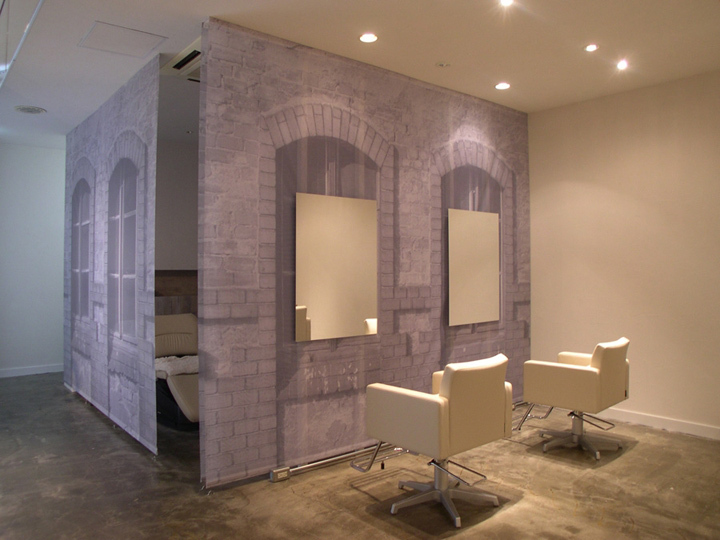 Another interestingly-framed beauty salon is the one named Folm arts. 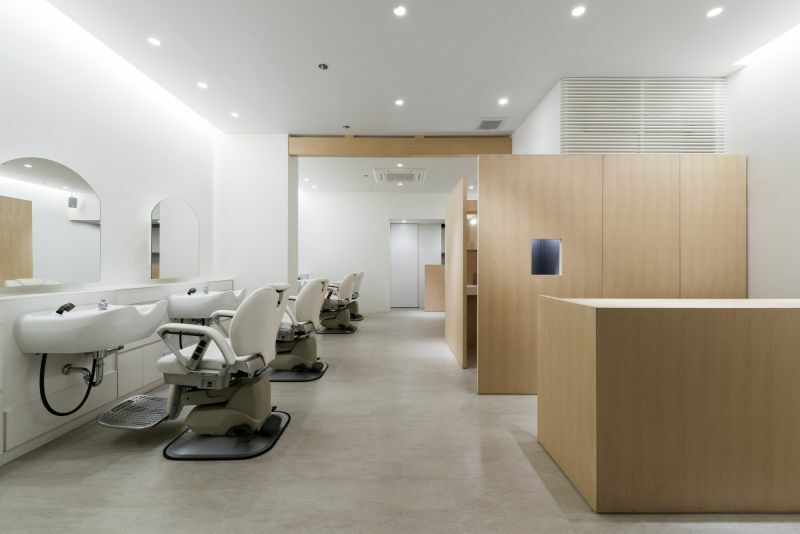 Located in Sakai Osaka, Japan, the salon was designed by in 2013 and occupies an area of only 55 square meters. 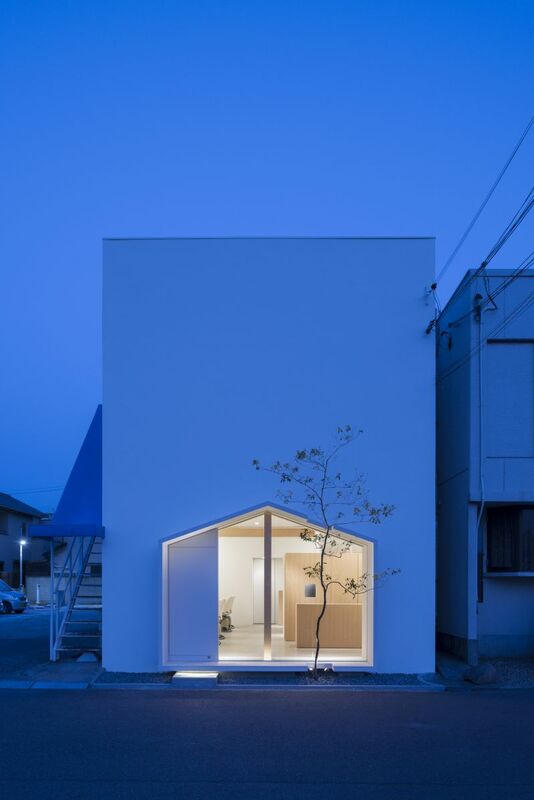 It stands on the ground floor of a minimalist building that has no other openings on this side and it blends naturally into the town setting. 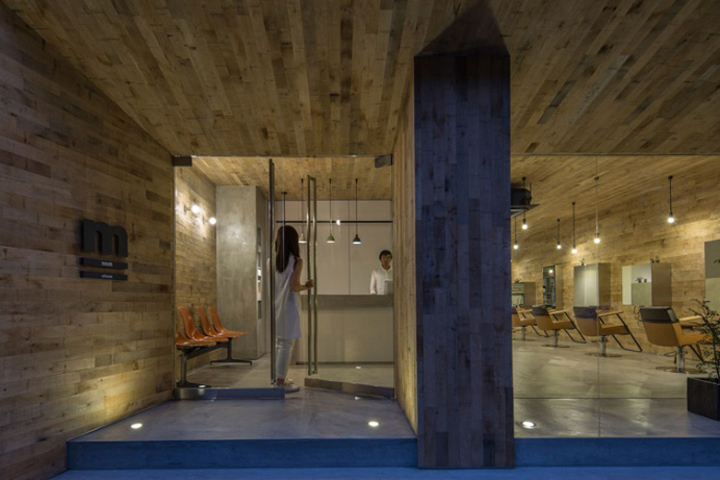 The house-shaped entrance welcomes clients into a bright and inviting space defined by light wood accents, compact forms and modern elegance. 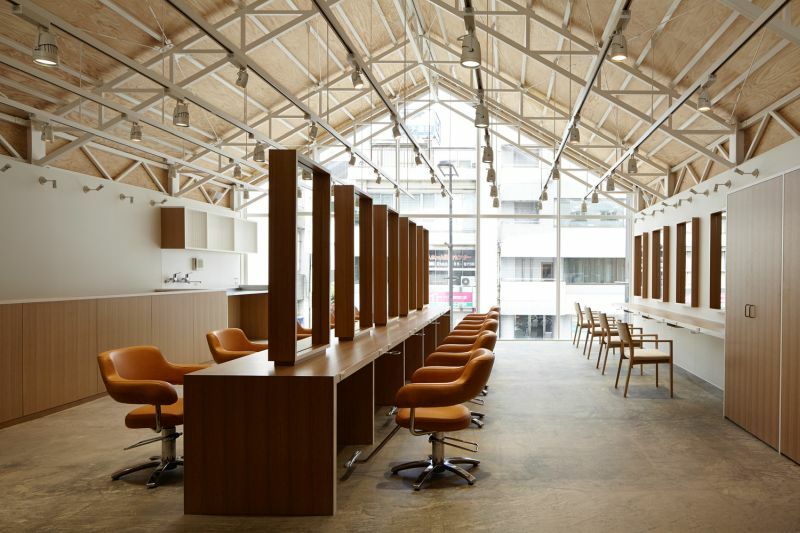 The Regalo salon from Japan’s Omiya suburb is organized on three levels and has a series of screen dividers that separate the spaces according to their function. 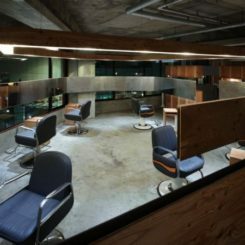 When created the salon, they had to convert two separate buildings, one which was made of concrete and the other being a wooden one. 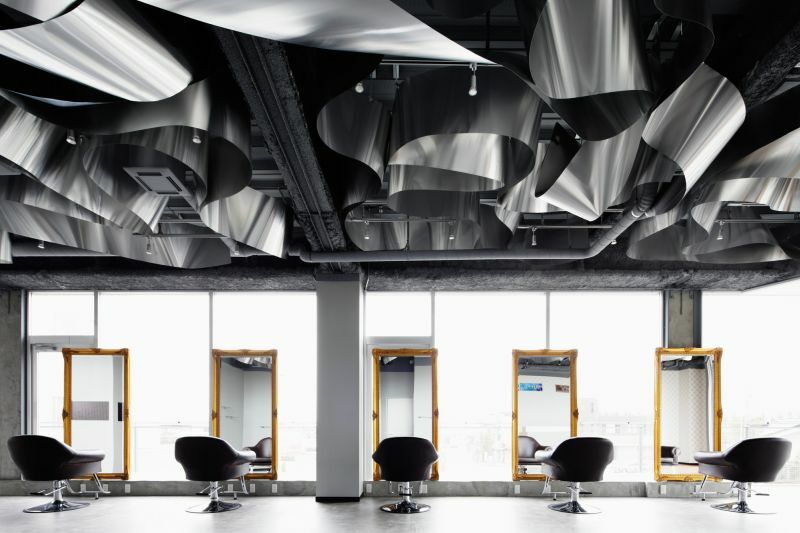 The second level of the structure houses the shampoo sinks at the center as well as the styling and reception area. 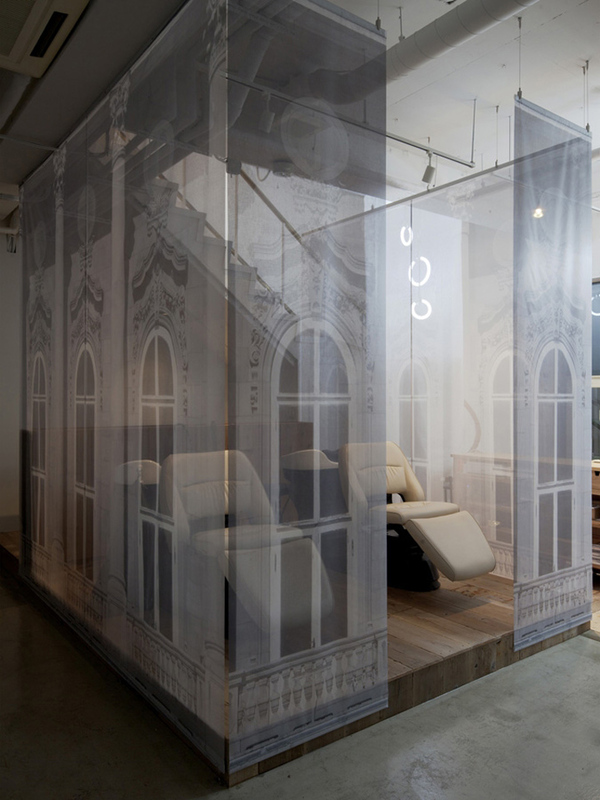 The screens that divide the sections have a translucent and ghostly look and they were chosen for their look and reduced cost compared to solid walls. 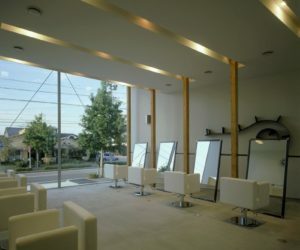 This is the Hair Do salon. 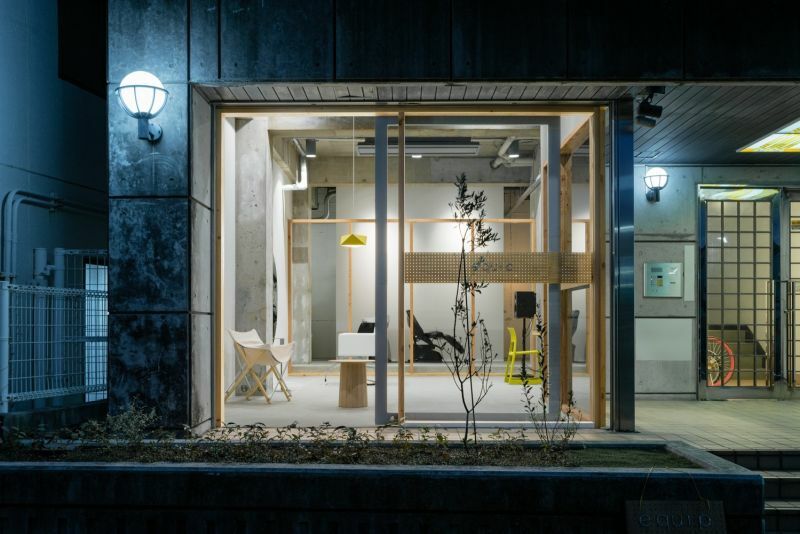 It was designed by in Japan and includes a total of 106 square meters of space. 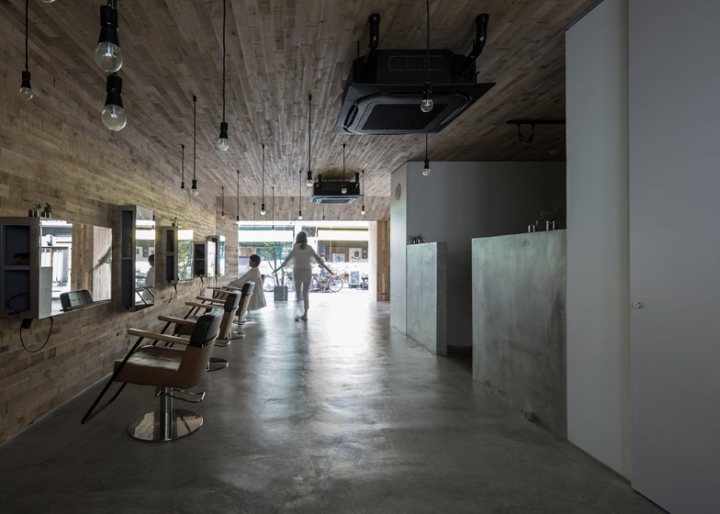 It’s a two-story salon with a glazed front facade that exposes its entire interior, drawing people in and looking quite theatrical from the street. 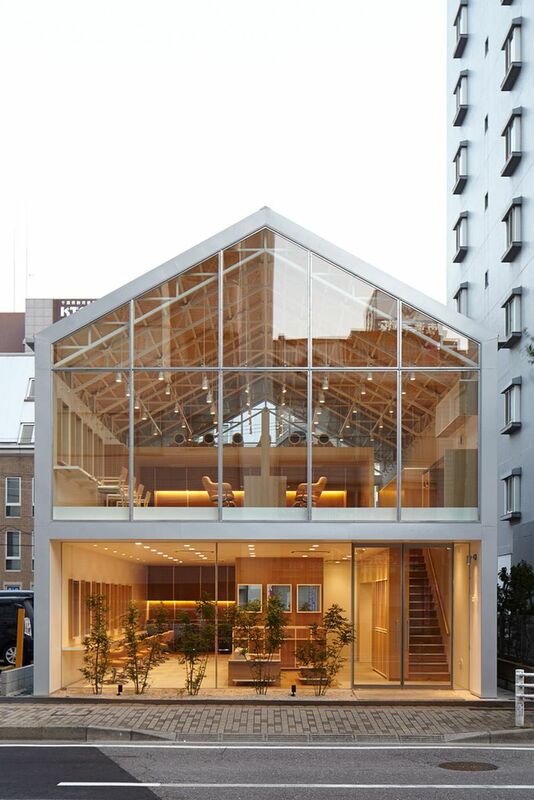 The gabled roof makes the upper floor look like a cozy attic but without giving it a cluttered feel. 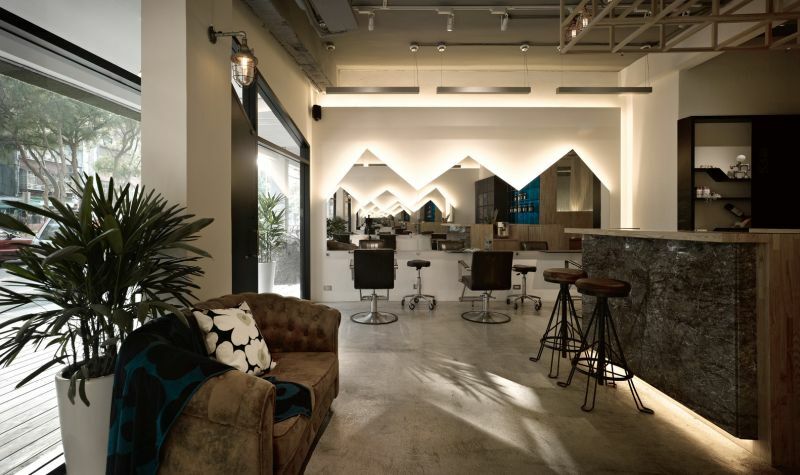 Abundant natural light enters through the glass facade and the décor is a combination of modern and industrial elements. 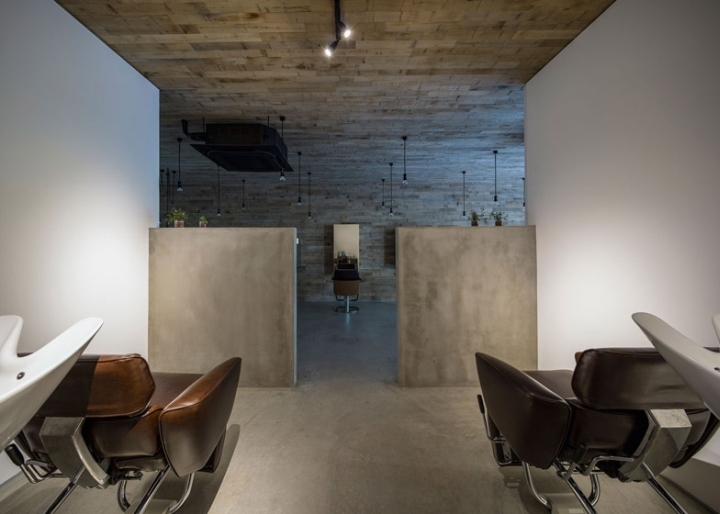 Before we leave Japan, we’ll also have a look at the Equip hair salon designed by in Osaka in 2015. 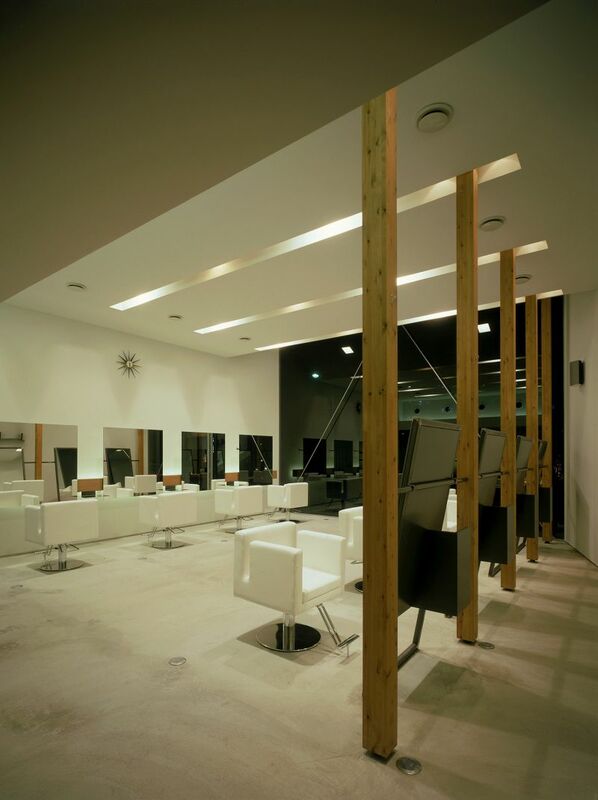 The owner wanted to bring some of the charm of mountain climbing into the salon but not in a very visible way. 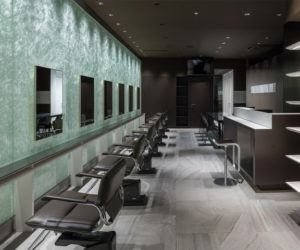 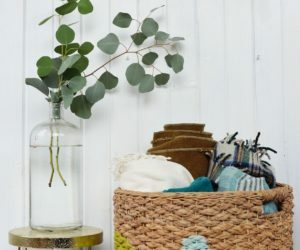 The idea was to make guests enjoy a new experience every time they come in here and the quiet location and small footprint made things both simple and complicated at the same time. 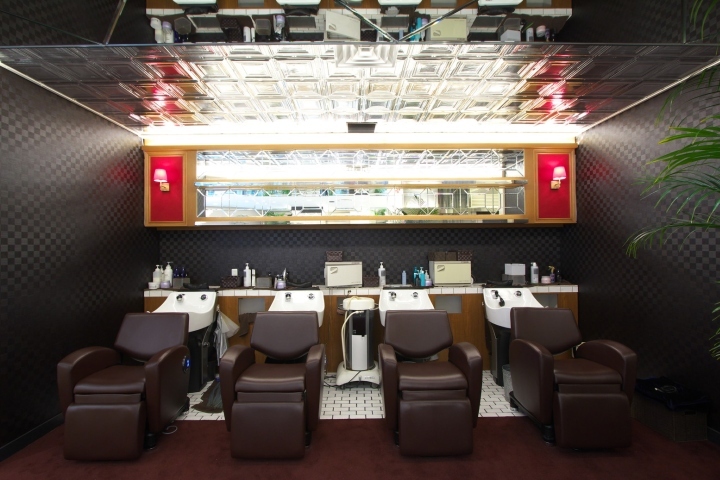 Everything inside the salon was carefully selected in order to offer guests a unique experience every time they interact with these elements. 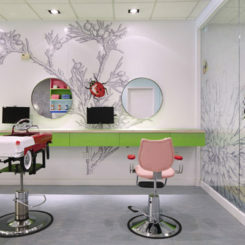 Beauty Salon Numero Uno Design. 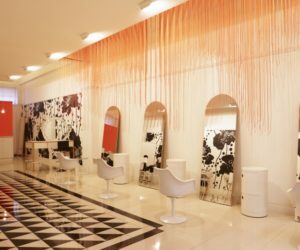 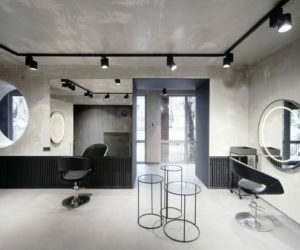 We’ll now travel to Kazakhstan to have a look at the stylish Numero Uno beauty salon designed by . 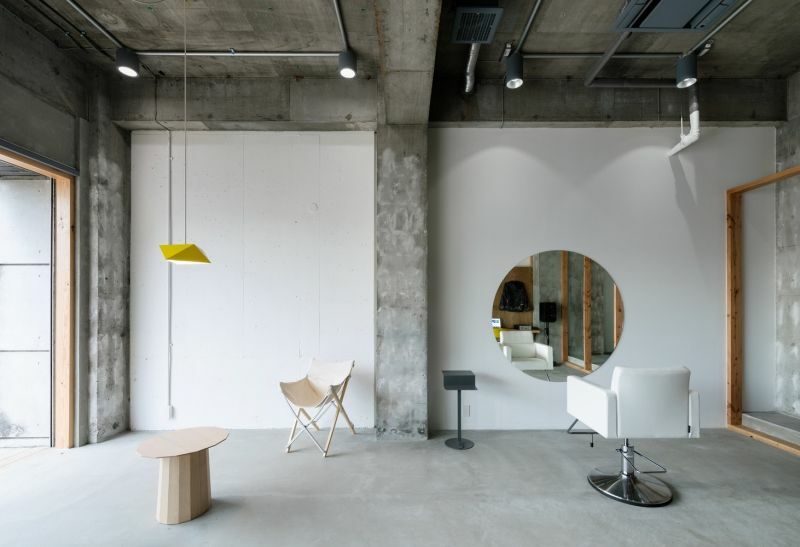 It’s meant to be a fashionable space hence the minimalist contemporary interiors. 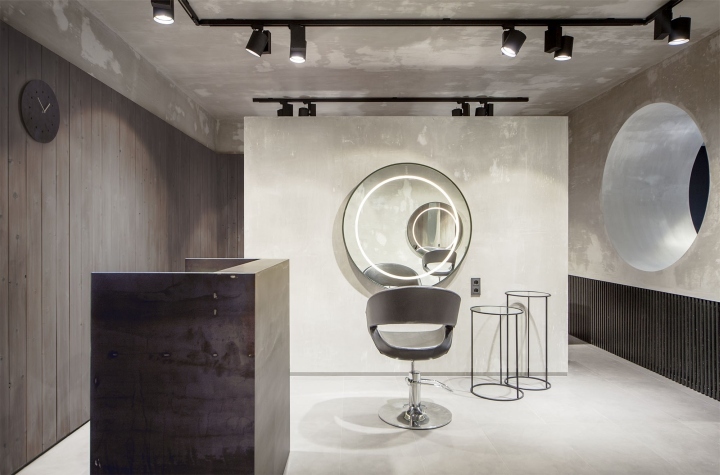 The unfinished concrete walls and ceiling are a trademark of contemporary design and they are used here to create an interesting contrast when paired with soft-edged furniture, round wall mirrors with embedded lighting and stylish accent features. 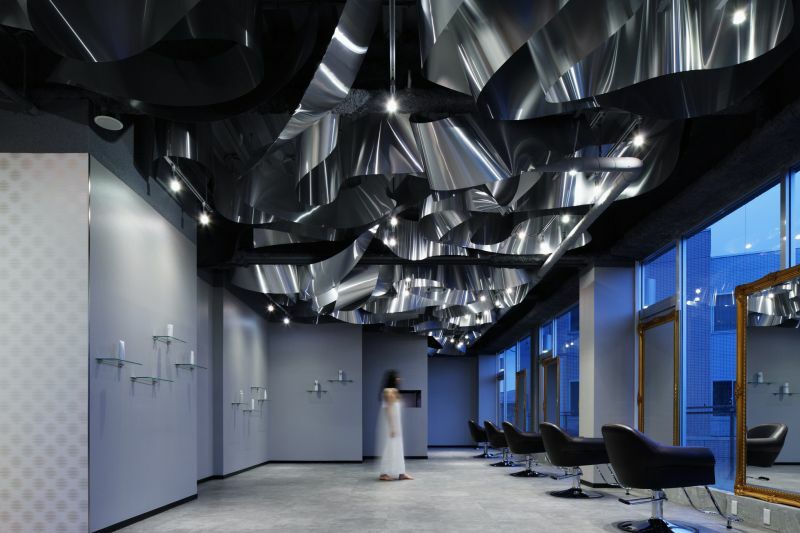 The lighting, on the other hand, is meant to be functional and to continue on the industrial palette introduced by the ceiling and walls. 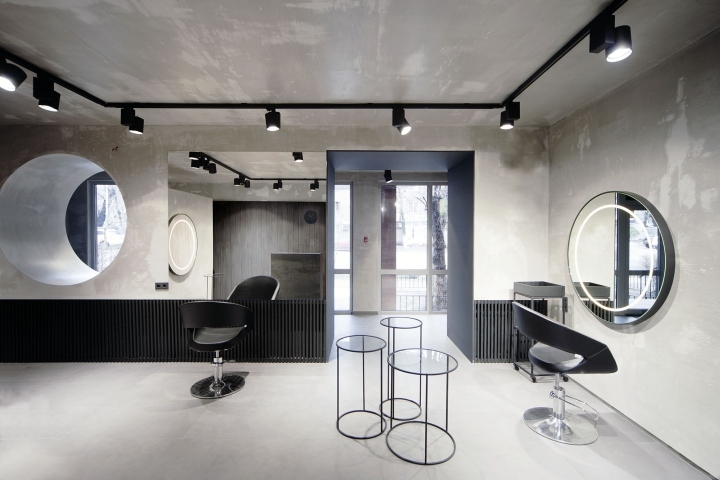 Overall, the design of this salon and both simple and complex and this makes it intriguing and alluring. 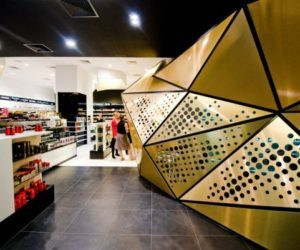 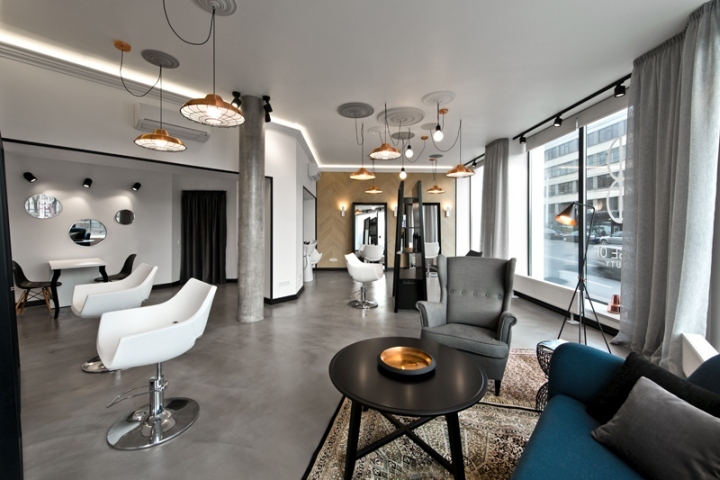 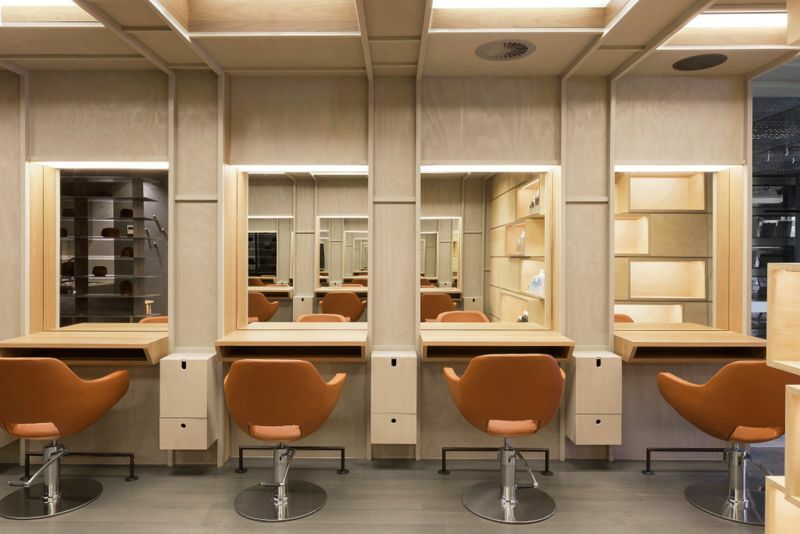 In the city of Vilnius in Lithuania you can find this modern beauty salon designed by . 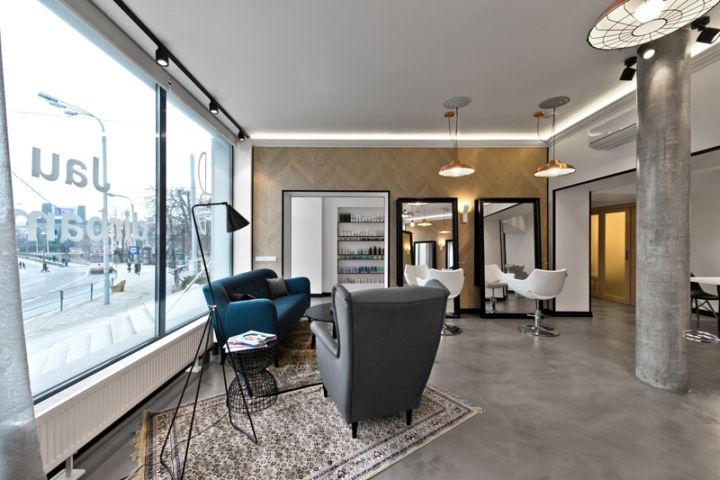 It’s a space that combines classical elegance with modern flair and has an open interior where most of the partition walls have been removed. 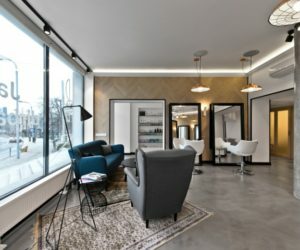 The salon looks very fresh but also very welcoming, having a design that makes it look a little bit like a modern apartment. 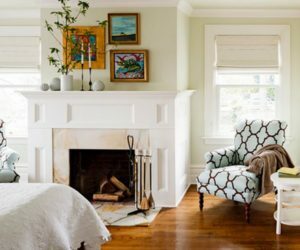 A comfortable sofa and a wingback armchair are complemented by a patterned area rug and a round coffee table and they form the waiting and lounge area. 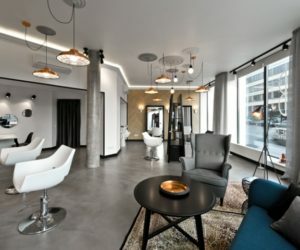 Large framed mirrors casually lean against the walls and metal pendant lamps with long cords and hanged from the ceiling in key spots. 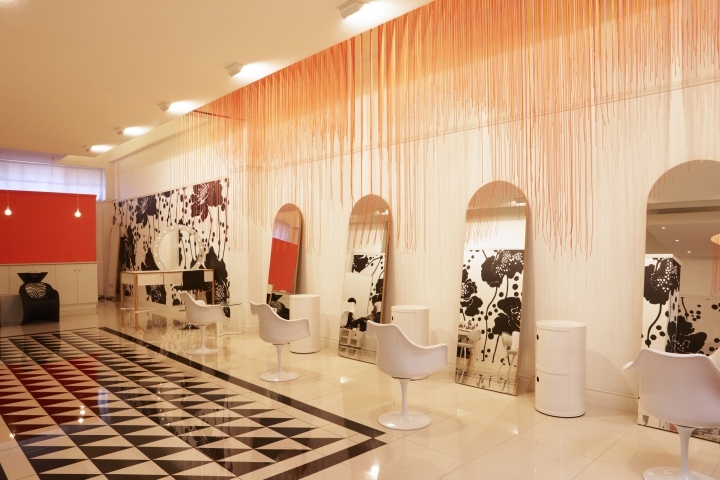 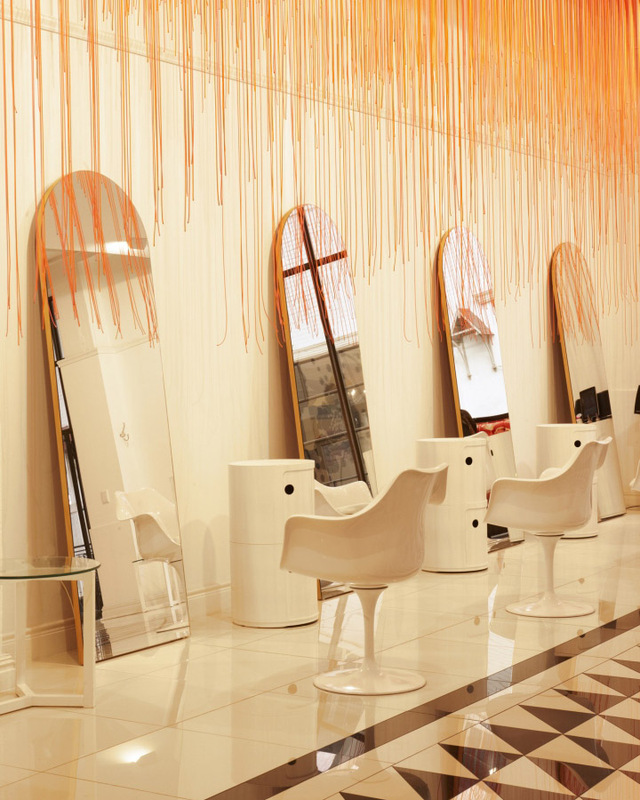 The interior of the Glam5 salon in Cape Town, South Africa is defined by a bright and cheerful chromatic palette. 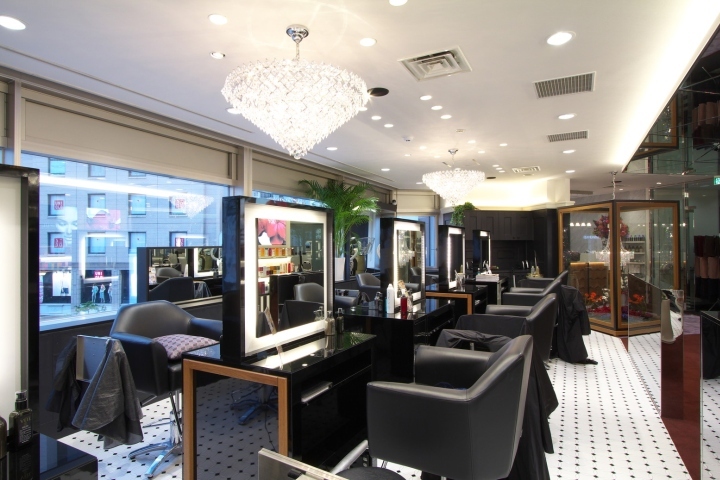 The salon was designed by and is meant to be a symbol of glamour, luxury and comfort. 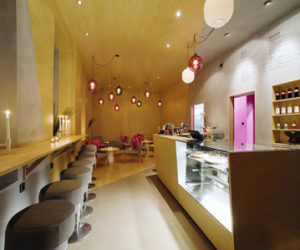 But despite being so impressive and eye-catching at first, the interior is in fact very cozy and inviting. 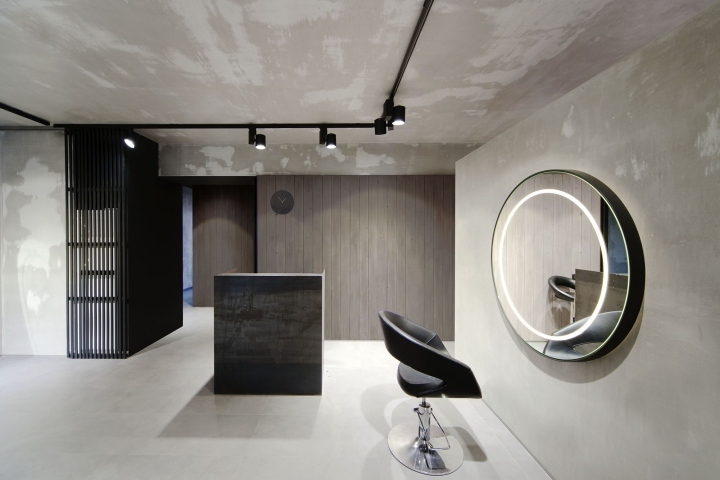 The reception desk is particularly significant, featuring a h and deep-buttoned surface and a coral shade that was reiterated throughout the interior is various forms. 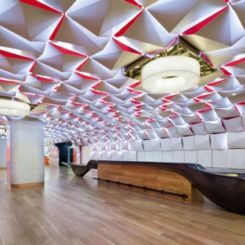 The floor features geometric tiles arranged in the form of an area rug and there’s a feature wall with coral strings hanging from the ceiling. 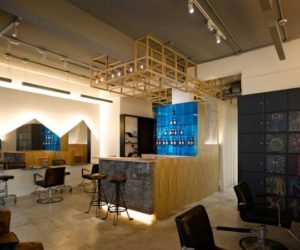 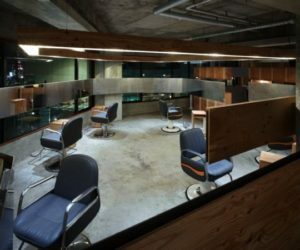 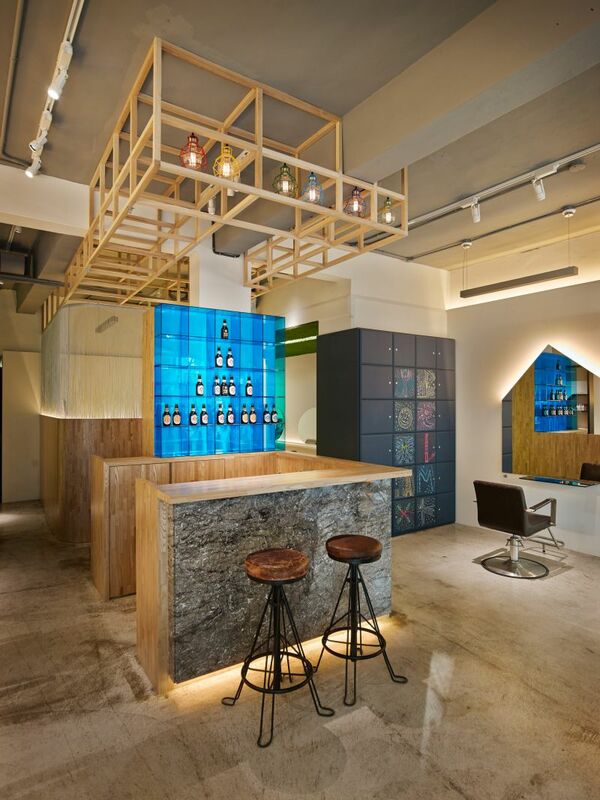 Located in Taipei, Taiwan, the PRIM4 hair salon occupies 98 square meters of space and was a project by back in 2014. 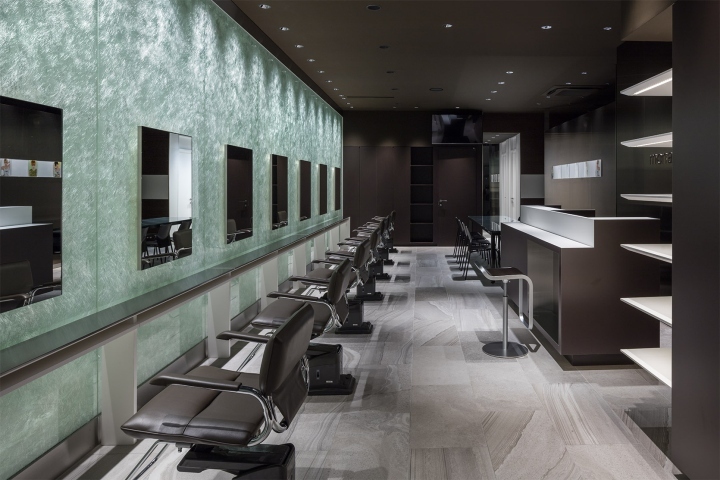 The lighting in the salon plays an important role in creating the overall soothing and sophisticated ambiance. 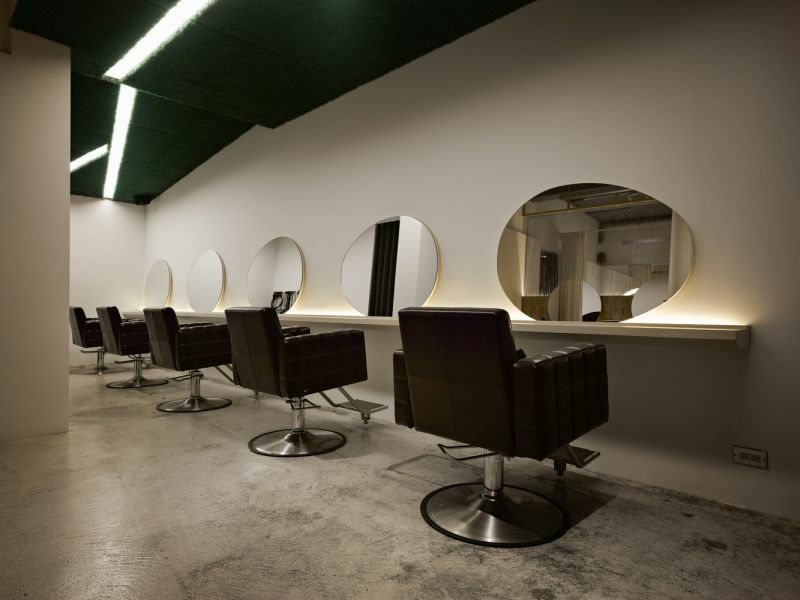 Also, the mirrors have oval shapes which complement the armchairs and ceiling light strips. 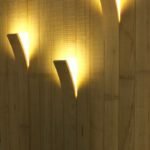 All the built-in accent lighting is meant to create a cozy and welcoming ambiance. 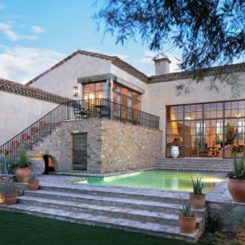 By staying away from the typical chandeliers and pendant lamps, the décor is more intimate and comfortable. 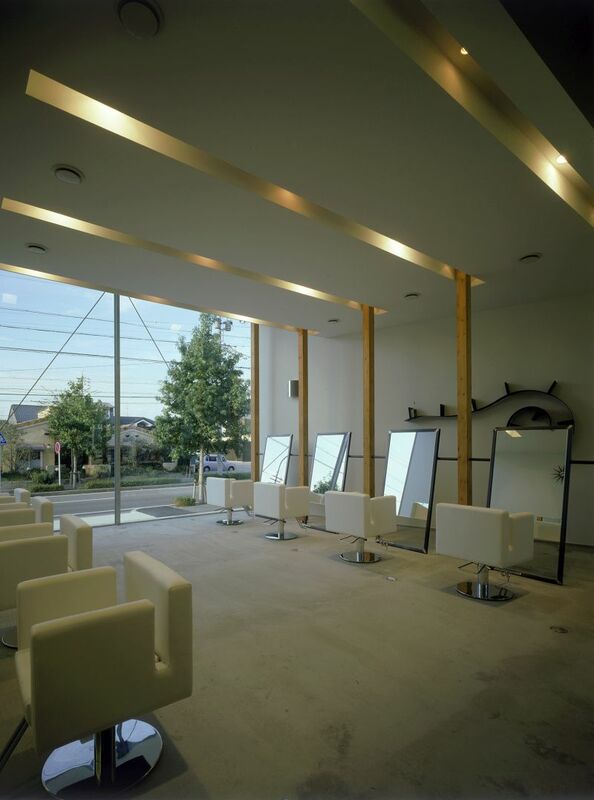 In 2014 the Roji Salon became a beautiful part of Canberra, a region in Australia. 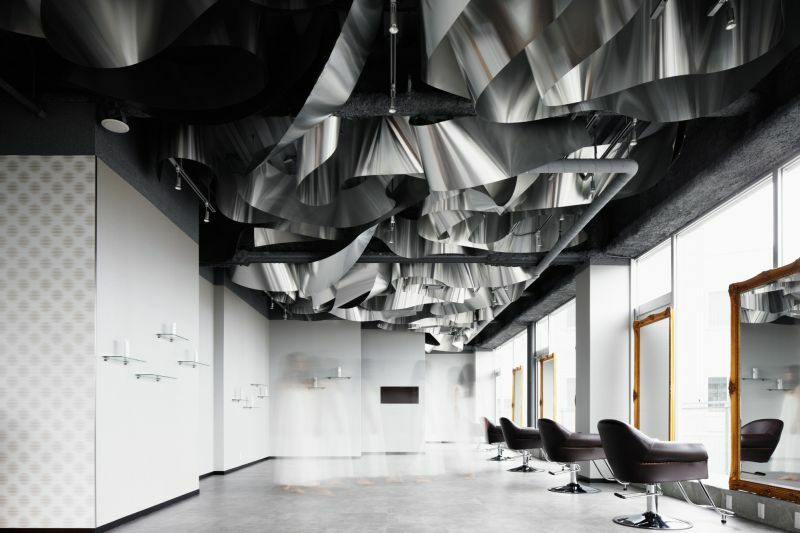 It was a project by and it covers an area of 72 square meters. 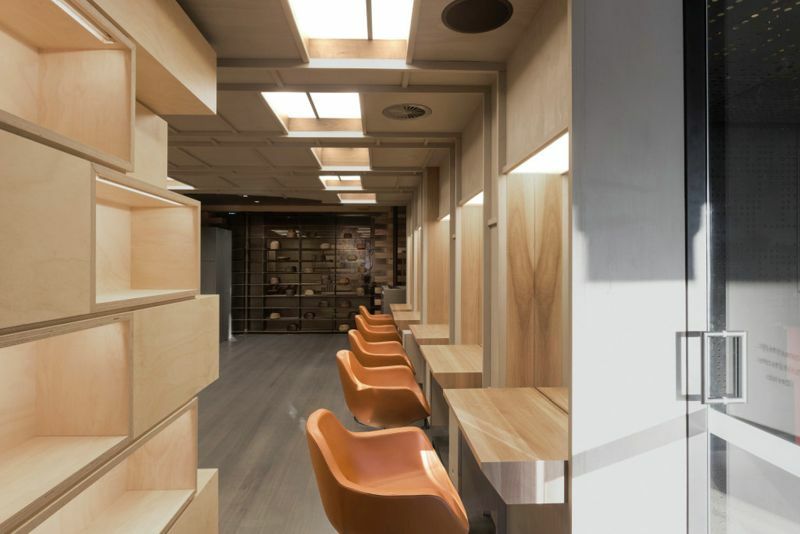 The fact that it’s so compact allows this boutique to feel really cozy and welcoming. 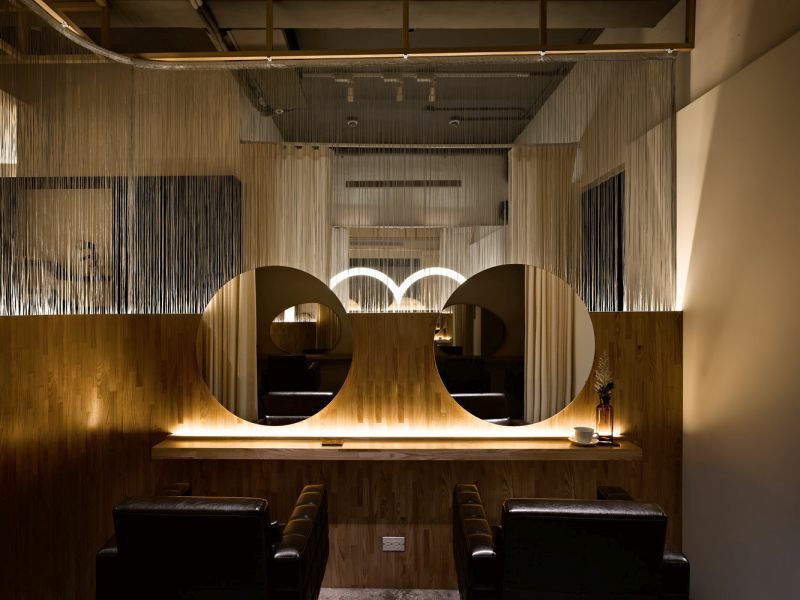 As the name suggests, the interior design has Japanese influences, being inspired by the roji path leading to the teahouse and marking the separation between the mundane world and this beautiful retreat. 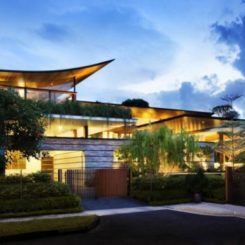 The overall design celebrates the concepts of renewal and serenity. 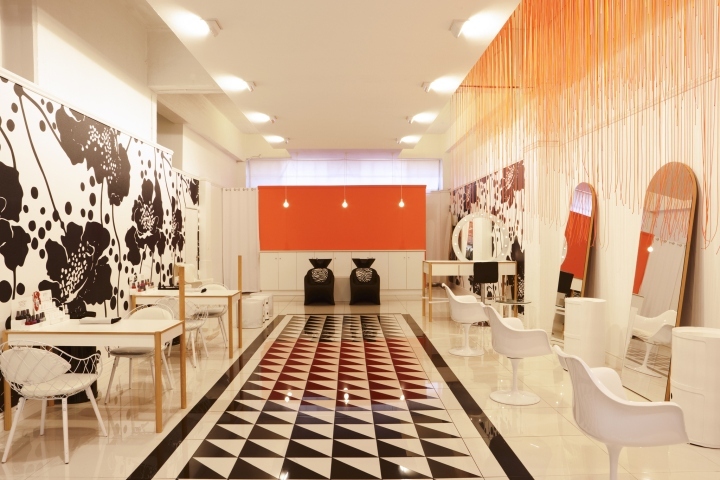 The space is defined by three zones, each with its own décor and color and material palette. 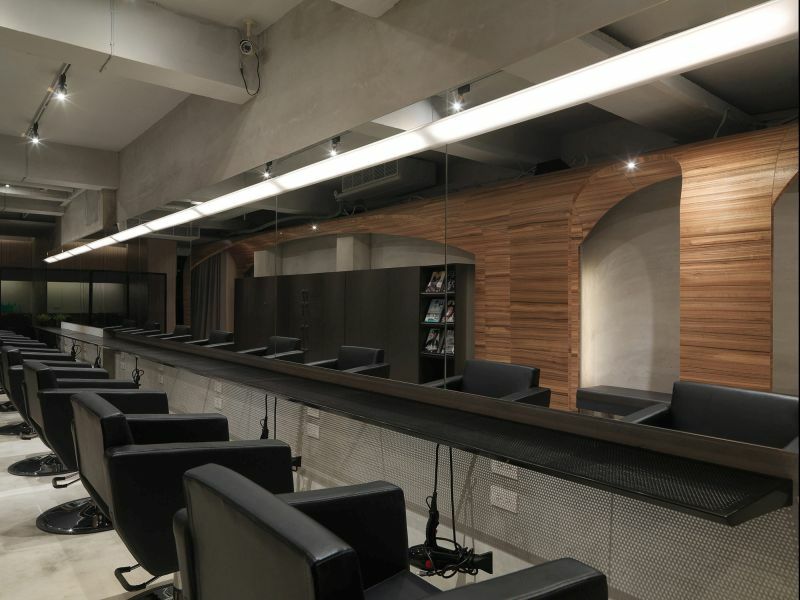 The entry area is a dark space which then leads to the styling area which is a lot lighter and open. 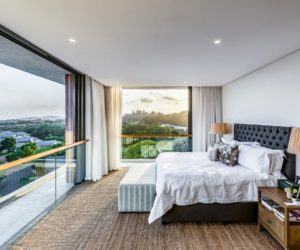 The third area is lined with cork and has natural sunlight and views of the landscape. 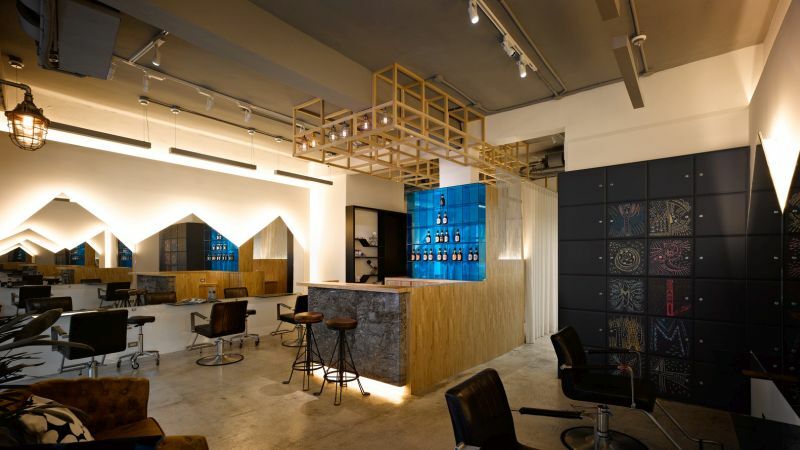 We end this article with a very beautiful salon located in Taipei, Taiwan. 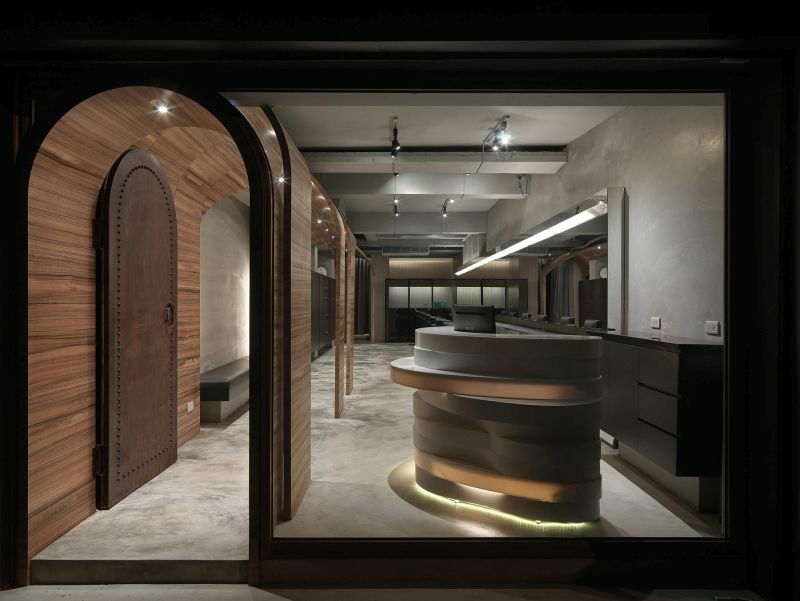 Its architectural beauty is the creation of and inside you can find elegant archways and sumptuous forms. 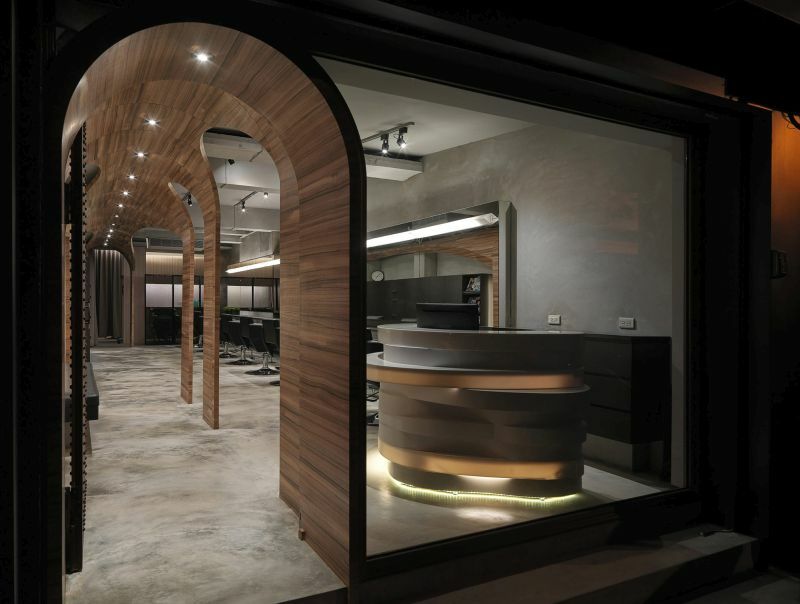 The architects wanted to transmit through their design the idea of transition so they created this arched tunnel. 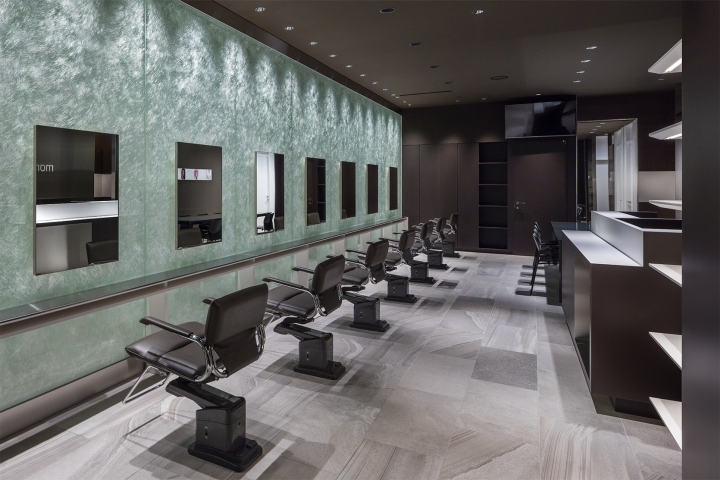 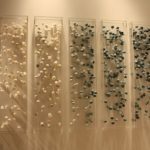 They also wanted to reveal the essence of the space so they exposed the walls, ceiling and floor and used synthetic stone to add texture to the space. 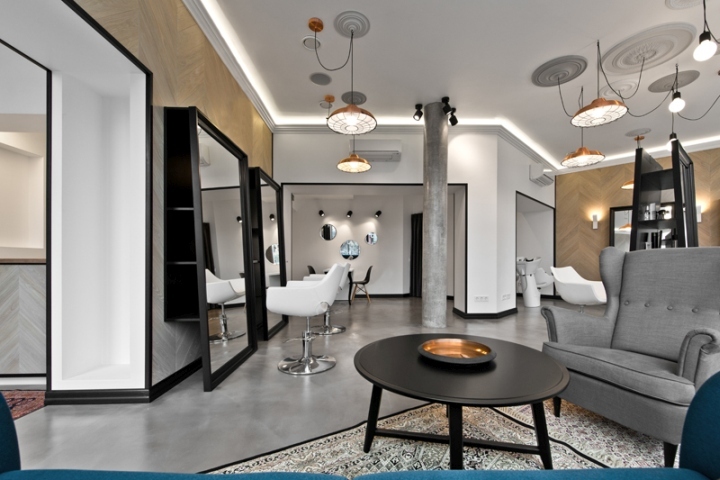 The lighting is strategically used to create the right ambiance and to highlight the key elements of the interior décor.